Karachi is not only Pakistan’s largest city in terms of population and area, but it is also one of the biggest metropolitan cities in the world. The city serves as the major commercial and business hub for the country. Karachi is home to hundreds of thousands of people belonging to working-class. Therefore, people need to commute each day to earn their living. But unfortunately, the megacity lacks a proper transportation system which is one of the major concerns of the citizens. The news about the introduction of Green Line BRT Karachi initially came into the mainstream back in 2016. The news was the fresh wave of hope for the Karachietes. However, due to continuous changes in the proposed plan and other hurdling circumstances, the launch of the project was delayed several times. The Karachi’s Green Line BRT once completed, will be the country’s largest metro bus network. So, Today we are going to explore some of the exciting details of this mega project. The mega project of Green Line bus for Karachi was essentially proposed by the ex-Prime Minister of Pakistan, Mr. Mian Muhammad Nawaz Sharif. The project was proposed almost half a decade back. The project was warmly welcomed by the local authorities keeping an eye on the success of the similar project in Lahore and Islamabad. The project once completed, is expected to facilitate over 3 lakh commuters on a daily basis. The development of the project started back in 2016 by Karachi Infrastructure Development Company (KIDC). However, the construction is still underway till date even after three years. Being the country’s largest metro bus network, the Green Line BRT needs a lot of funds for its establishment. According to a rough estimation, the cost of the project is almost 25 billion rupees. The major portion of this cost will be financed by the federal government of Pakistan. Apart from the government’s support, other private and public resources will also be utilized in order to meet the required finances for the establishment of the mega project. The local authorities of the city are also considering to go after World Bank and ask for their support to begin work on the third phase of construction of Green Line BRT. Karachi Metrobus project is one of the most enormous ongoing projects in the country. The project running through dozens of kilometer in Pakistan’s largest metropolitan requires a lot of managerial dedication to reach its destination. Therefore, it is highly feasible for its development, to be divided into multiple phases. At the moment, a couple of phases of Green Line BRT are under construction. However, their progress is still way behind their desired schedule because of the unexpected delays ignited by the changes in proposed design and infrastructure by relevant authorities. Meanwhile, the project has also a third phase that will further stretch out the project from Taj Medical Complex to Municipal Park. However, the project will also contain the third phase that will extend the project from Taj Medical Complex further to the Municipal Park. The project has seen a lot of work in terms of its infrastructure and the corridor of around 18 kilometers is under construction. The Green Line BRT will provide state-of-the-art public transport facility to the Karachietes. Therefore, the route of the bus contains many flyovers on different intersections. The major portion of the project’s infrastructure has already completed. The different expressways and roads of the city see traffic congestion on a daily basis due to the construction works of this project. The backup arrangements made by the government by providing alternative routes are not effecting in avoiding traffic jams. The traffic problem in the as big as Karachi is not something unusual, particularly when the city is overpopulated and suffering from severe illegal encroachments. Despite the fact that construction activities of Green Line BRT have further complicated the traffic situation in the affected areas, however, the project has been proposed and expected to reduce a load of vehicular traffic from the roads of Karachi once completed. The starting point of Green Line BRT will be Shahrah-e-Usman in Surjani Town. Passing through miles from the beginning to the ending point, the route will go along Shershah Suri Road. It will then run along Shershah Suri Road where a number of flyovers have been constructed to keep the Green Line route apart from all sorts of traffic interruptions. Moving towards the south in depth, the corridor will pass through the route of Nawab Ali Siddiqui Road, Business Recorder Road, Gurumandir, Numaish Chowrangi, and all the way to the Municipal Park on M.A. Jinnah Road. 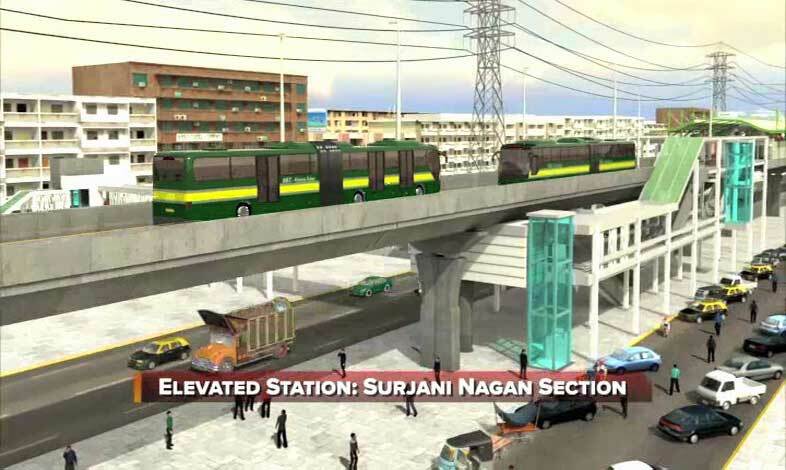 Several dozens of stations are included in the design of the route for Green Line BRTS Karachi. The overall route is approximately 18 Kilometres in length. After completion of this project, Karachi’s Numaish Chowrangi will become the home to South Asia’s very first underground Metrobus station. Despite the fact that the completion date of the project has been delayed several times, the construction of the mega project has almost touched its concluding phase. So, it’s highly expected that the Green Line BRT will be operational this year. The activities of the development of all the infrastructural work have been efficiently supervised by the Karachi Infrastructure Development Company Limited (KIDCL). All the relevant authorities are looking pretty much satisfied with the pace of progress and planned to inaugurate the mighty Green Line BRT in the middle of this year.